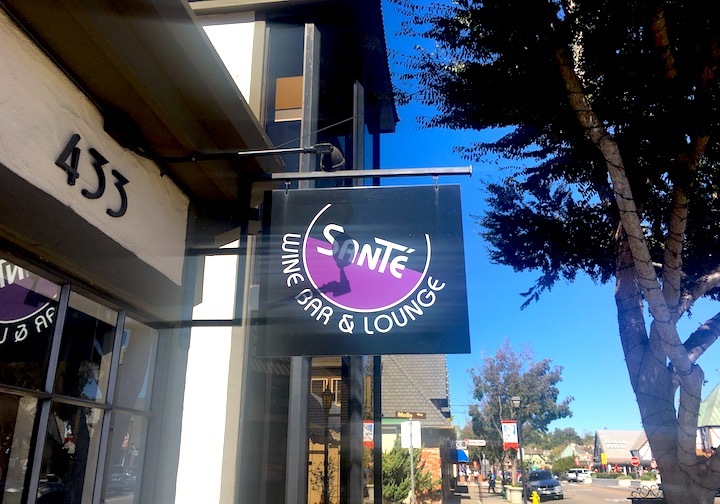 Nestled in the Santa Ynez Valley, this picturesque town of Solvang, translated into English as “sunny field,” boasts a very interesting heritage of Danish culture. 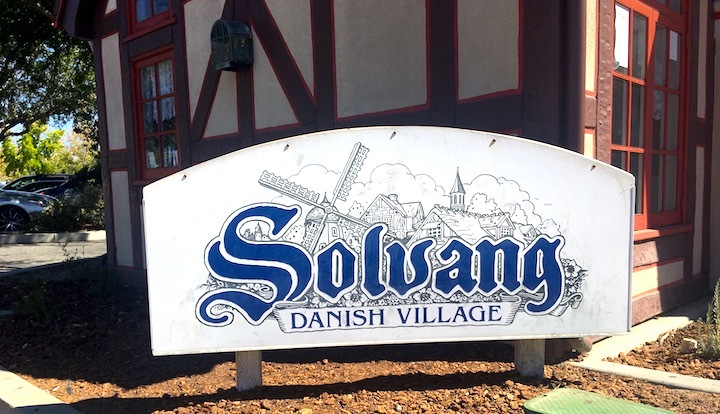 For those who’ve never been to Denmark, a trip to Solvang is a unique opportunity to get a taste of the country without having to leave the USA. 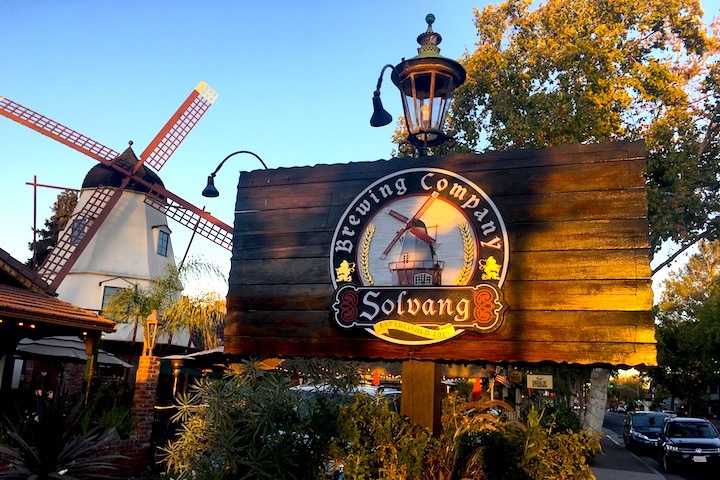 Famous for its appearance in the movie Sideways, Solvang has much to offer everyone. 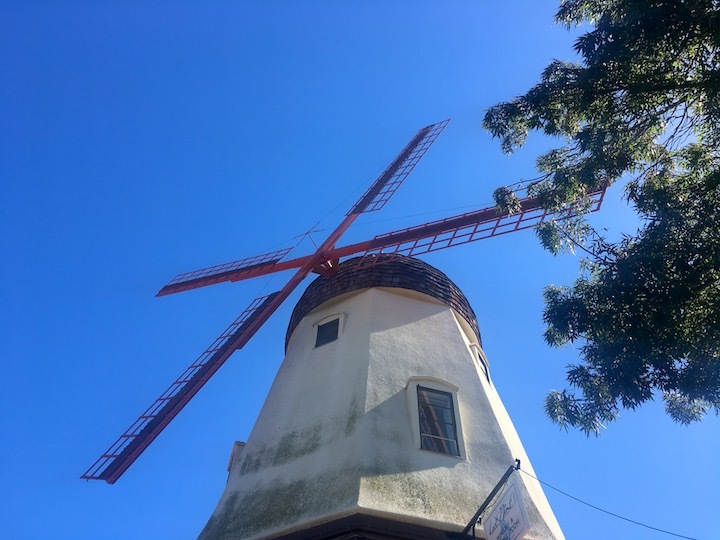 Despite its attractions, history, and beauty, most people visit Solvang for two reasons: wine and food. Solvang is, indeed, a beautiful city. 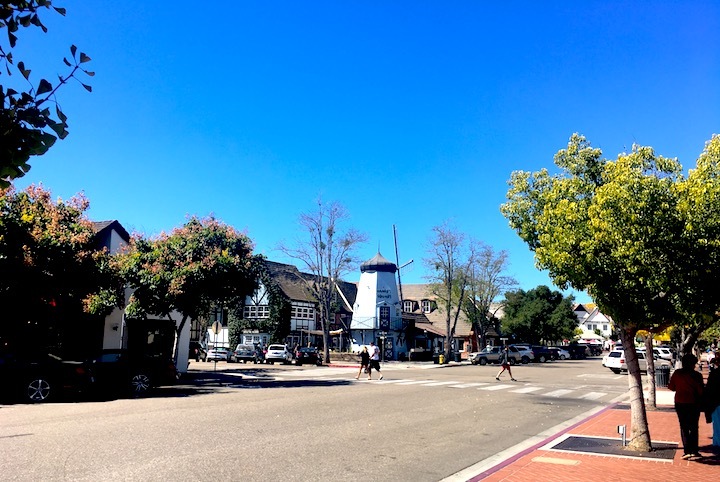 Mission Drive, one of the main streets in Solvang welcomes visitors with traditional Danish buildings, including a replica of Copenhagen’s city hall clock tower (it’s 1/3 the size of the original), half-timbered buildings, homes with thatched roofs, stained glass windows, and, of course, windmills. Chimneys with artificial storks nesting atop them, and cobblestone streets also add to the allure. 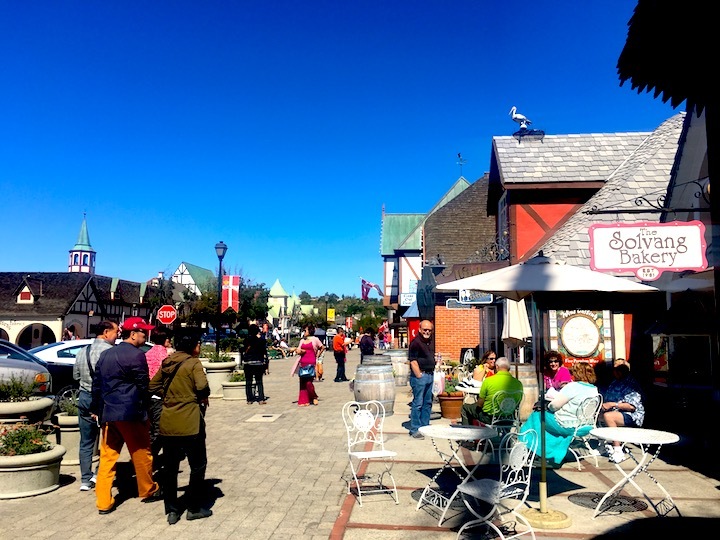 There are two different versions of how Solvang became a tourist attraction. Some say it’s because of the local bakery, Birkholm’s Solvang Danish Bakery & Café. The owner was so enthusiastic about his Danish shortbread cookies that he started advertising on small, handmade boards posted on the nearby highway, in order to draw people to the small town. Eventually, his cookies, which were sold in tins with a map of the city on the bottom, ended up on store shelves across the country and led to Solvang’s fame. 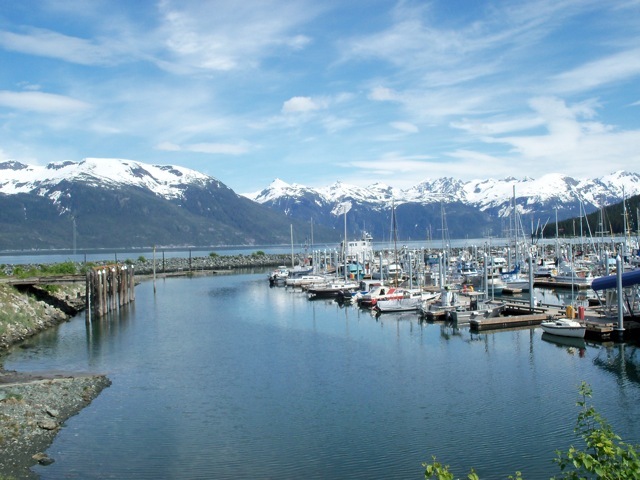 In 1947, the Saturday Evening Post published an article about this unusual town. 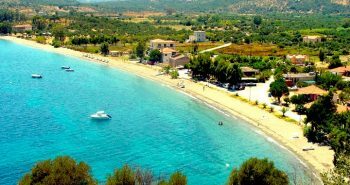 It generated such an influx of curious visitors that it ultimately became a tourist attraction. However, the heritage started before 1947. 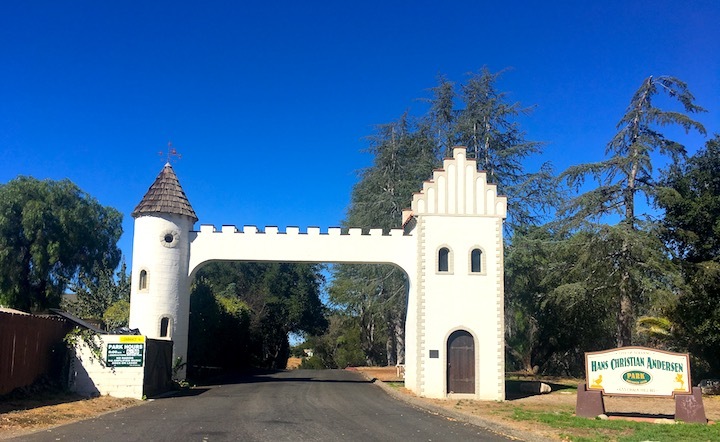 In 1911, a group of Danish educators stumbled upon the lush Santa Ynez Valley while looking for a place to establish a folk school. They decided that it was the place to establish a community and be able to live as farmers. After the founding of Atterdag College, everything else fell into place, from businesses to schools to churches, including the famous Bethania Lutheran Church built in 1928. You can spend a day or a weekend discovering the whole city. 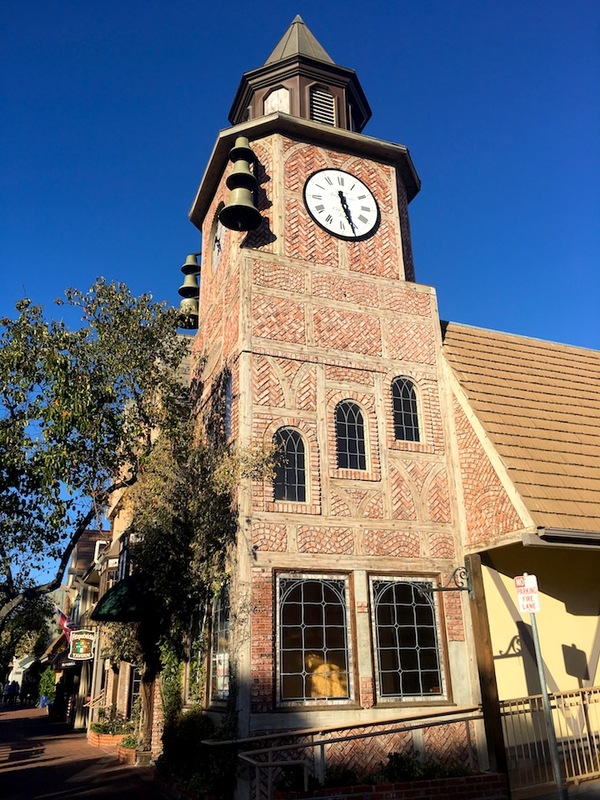 The downtown is a busy place, especially the Solvang Village Square with tourists at every corner snapping pictures of anything Danish—it’s a selfie-lovers paradise. 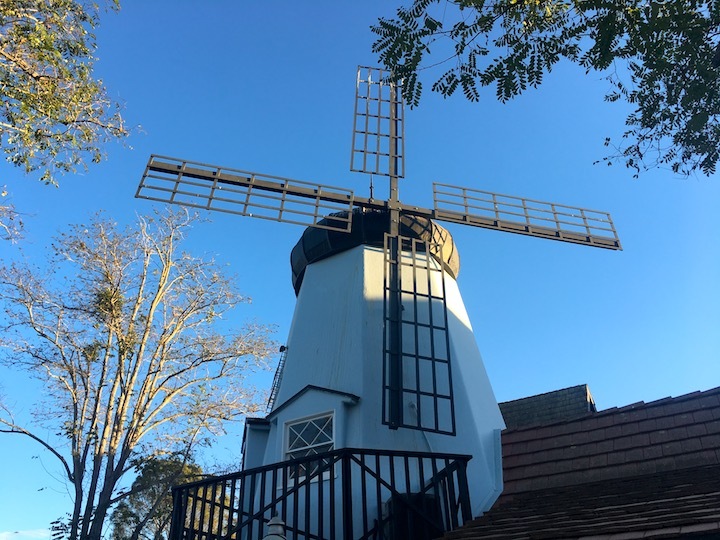 There are four windmills in Solvang, with the first being built in 1947 by Danish-American Ferdinand Sorensen. 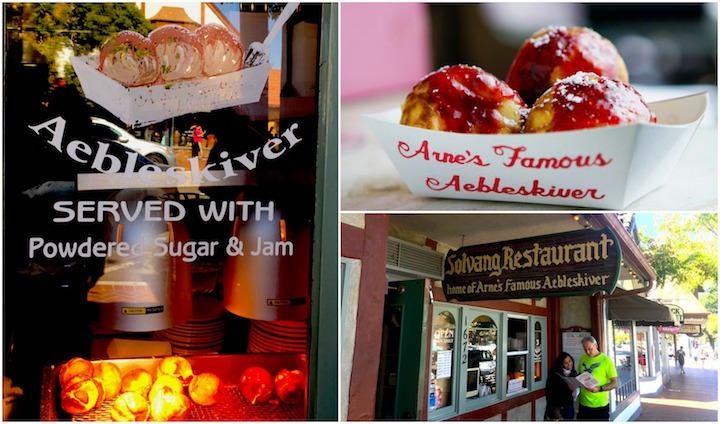 As you walk along the streets of Solvang, the sweet aroma of baked goods will lead you to the numerous bakeries located on every corner. Step into Mortensen’s, Olsen’s, Solvang Bakery, Danish Mill, Birkholm’s, or the Solvang Pie Co., and you’ll be spoiled for choice with the selections of cookies, pastries, and cakes on display. Be sure to try aebleskiver, a round, pancake-like puff pastry sprinkled with powdered sugar and served with jam. 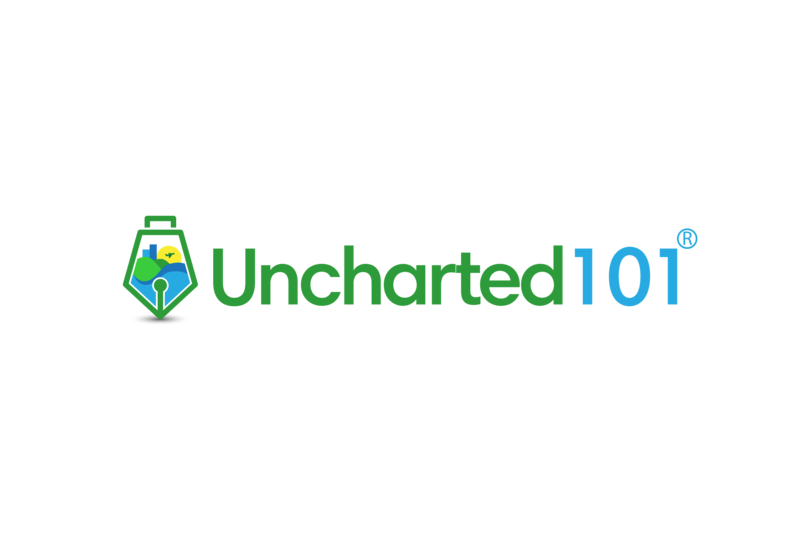 There are over 100 wineries, and more than a dozen places to taste wine while exploring the city. 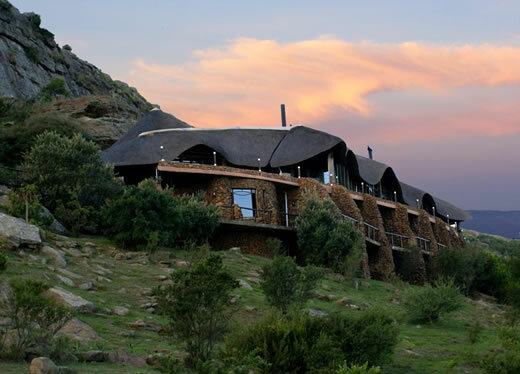 It’s obvious that most tourists are attracted to the wines like bears to honey, spending their days sampling the varietals with their friends and family. No matter what time of the day, it’s always a good time for wine. A catchy slogan for them, I’d say. If you’re looking for a bite to eat at breakfast or lunch, there are plenty of restaurants to choose from, with waitresses dressed in traditional Danish outfits. When dinner comes along, however, there aren’t many choices, since most businesses close at around 5:00 or 6:00. Those that remain open are bit pricier for tourists. Dinner for two could easily cost $100, if you’re lucky, without figuring in the wine. For dinner, drive to the nearby town of Buellton and take a seat at the Hitching Post, which was also filmed in Sideways. You can watch the chef prepare your steak to order over a wood fire. 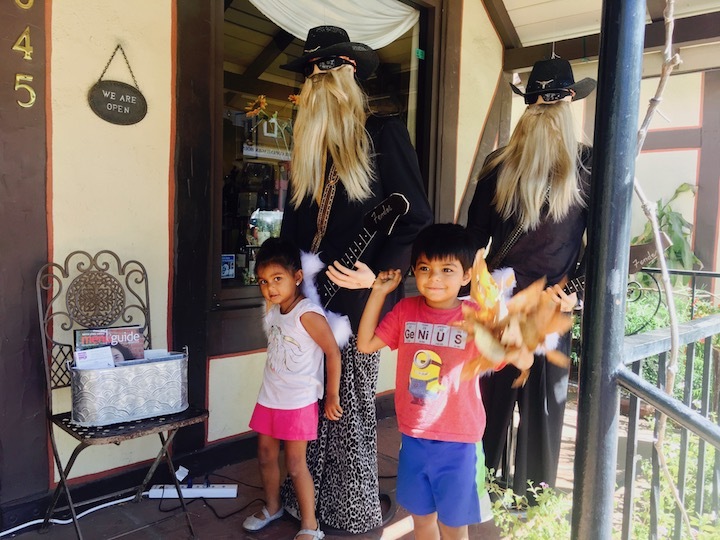 Even though Solvang is far from a kid-friendly city, there are options for the little ones to enjoy. The Hans Christian Andersen Park, which is located a few blocks from the main strip, is a large, open area with a playground for kids as well as a path around the park for adults who want to run or walk. On the other hand, the ideal Sunny Fields Park is one of the best playgrounds I’ve ever seen. 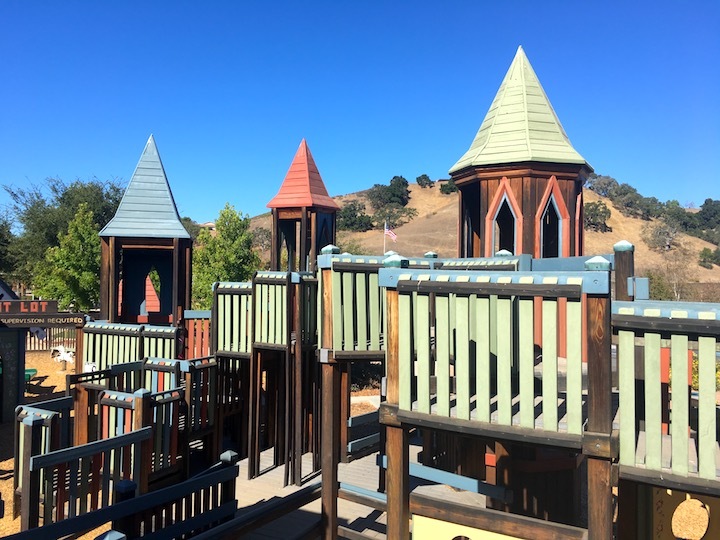 Shaped like a maze, kids can run, play hide and seek, and enjoy the many towers, stairs, and walkways that abound. Naturally, our two children cried when it was time to go. 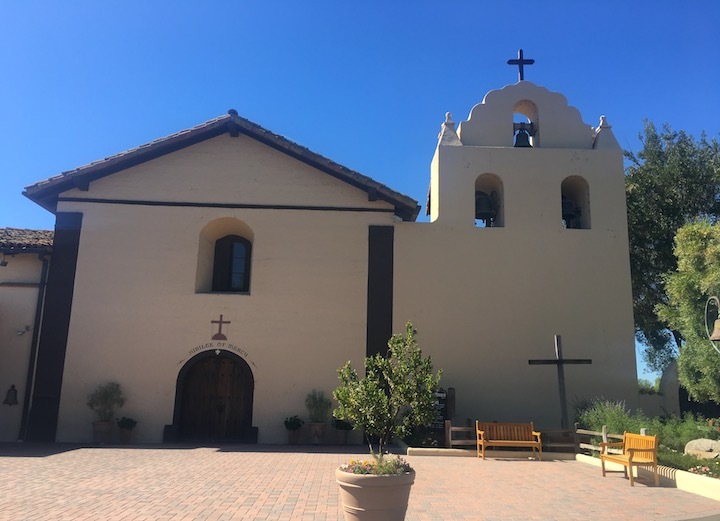 The Santa Ines mission, established in 1804, was one of the final 21 missions to be established in California. A museum today, it features artifacts, original bells, and priests’ garbs. Though visiting missions are interesting, they also hold a grim past of destroyed lives, tears, and deception. The grim graveyard, a tribute to the death of Jesus, left a dark impression on us. 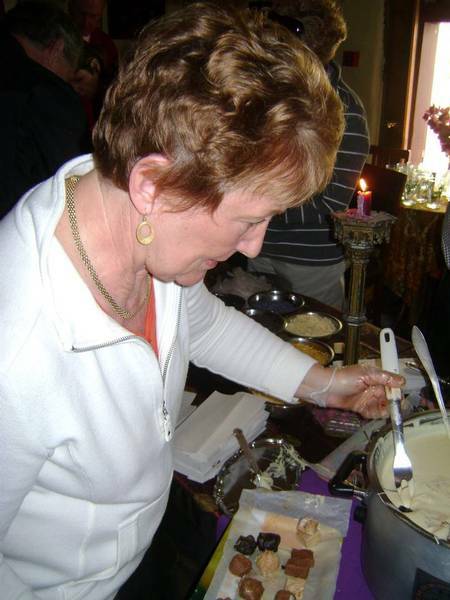 The Elverhøj Museum is a great place to learn about the history of Solvang and Danish culture. The Hans Christian Andersen Museum provides insights into the author’s life and his books. There’s also a miniature replica of his childhood house on display. Of course, you can read and buy his books to enjoy some quiet time. And if you’re a motorcycle fan, visit the Solvang Vintage Motorcycle Museum. Wilding Art Museum displays a small, private collection of art that ranges from animals to landscapes, as well as bronze sculptures. The Quicksilver Farm has miniature horses, and it’s only a five-minute drive from downtown Solvang. Despite the kitsch, Solvang is a beautiful city. However, there’s something missing. It really felt like people weren’t kid friendly and were treated like an annoyance. We experienced this first hand with our kids, and others who we met there said the same. It seems more of a place to visit if you’re single, a couple, or a group of friends who want to spend time wine tasting and savoring Danish food. 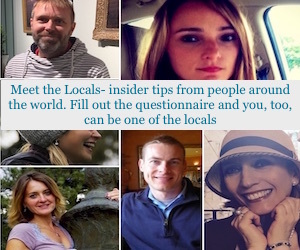 Next postA Day in the Life of a Travel Blogger: Whoops Where Am I? We go to Solvang several times a year. It’s a short drive from LA, and it feels like a completely different world than the city life of LA. The wines are really tasty at the local wineries, and there are so many yummy treats at the local bakeries. 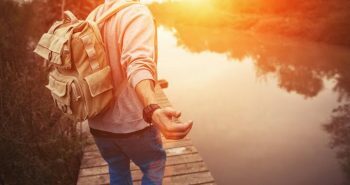 If you go, realize that most of the shops and restaurants close by 6pm, so eat dinner before then or seek out the handful of locations that have extended hours. We usually stay at our timeshare, so we grab groceries and BBQ with friends and family that join us on the adventure. Thanks Lee. Yes, you are right about the restaurants close by 6 pm. We learned that the hard way :). It sure is a beautiful place to visit. Thanks for the comment. Yes, California is beautiful and each city has its own charm. 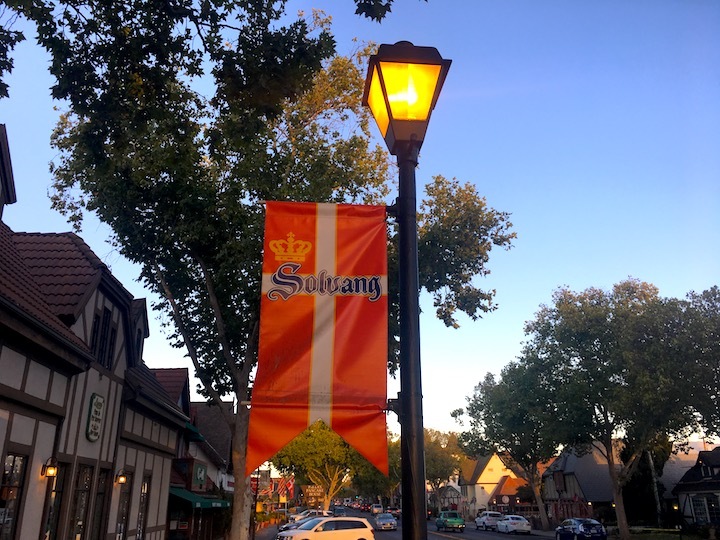 Solvang has a unique charm that any other city has. Food is always great and unique. Glad you love them and sorry you don’t like much the midwestern cuisine?